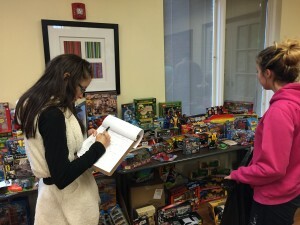 The holiday season is always a very busy time for everyone, including Ronald McDonald House Charities of Alabama. This year was no different. 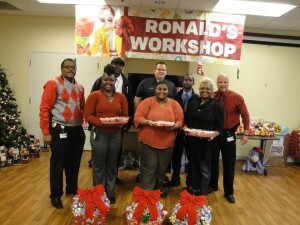 And as always, thanks to our loving and caring community in Birmingham, we had gifts for all ages in time for one of our annual Christmas traditions, Ronald’s Workshop which allows families with a sick or injured child who are staying at RMHCA to “shop” for gifts for their children. This is truly needed since some of these families have been with us since before Thanksgiving and have had little time to even think about holiday gifts. Others may have only been with us for a week, but are not familiar with the area and don’t know where to go holiday shopping. In addition, since all members of a family are sharing one room, there is little privacy for the parents and no good place to hide presents until Christmas morning. This is where Ronald’s Workshop comes to the rescue. It is held just before Christmas so some of the stress can be relieved. We offer gift wrapping and have gift labels on hand so that families can have everything ready for the big day. For example, this year one of our families with five children was struggling to capture the magic of Christmas for their four healthy children while still caring for a premature baby in the NICU. Worries like “Will Santa find us here?,” “Will the kids wake up while we put out gifts?,” “How will we celebrate with our newborn?” created real concerns for various members of the family. Hopefully, Ronald’s Workshop helped alleviate some of those worries. We cannot possibly show the appreciation to each company, organization and individual that is deserved, but to each of you who donated or volunteered your time — THANK YOU! You made the holiday season a little less stressful for families who already have enough to worry about. 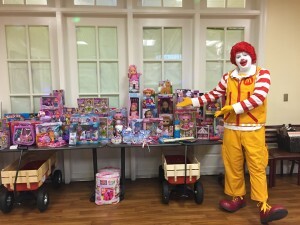 Special thanks to the Birmingham Police Department, Children’s of Alabama, United-Johnson Brothers, BBVA Compass, AT&T, and many, many other caring individuals who donated items and time to Ronald’s Workshop.